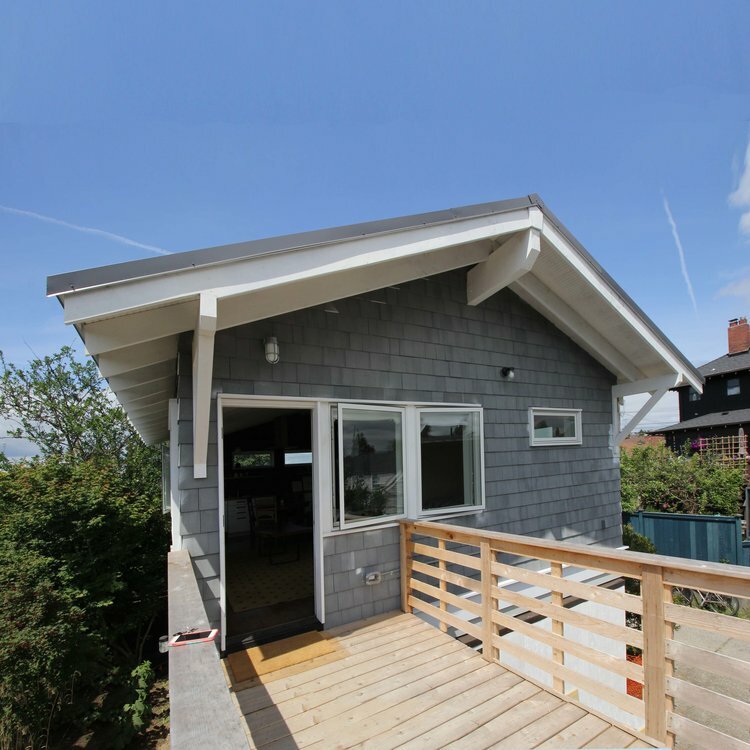 our blog for all things backyard cottage (detached adu's) and small house design. When Sarah and Mark moved into their 1950’s 2-bedroom rambler in Ballard 20 years ago, they saw lots of potential. After first renovating the main house, they recently maximized the value of their property by adding a backyard cottage. Sitting atop a first story garage, the DADU’s open, airy top floor is a versatile living space that is perfect for the homeowners and their guests alike. The interview has been edited for length and clarity. 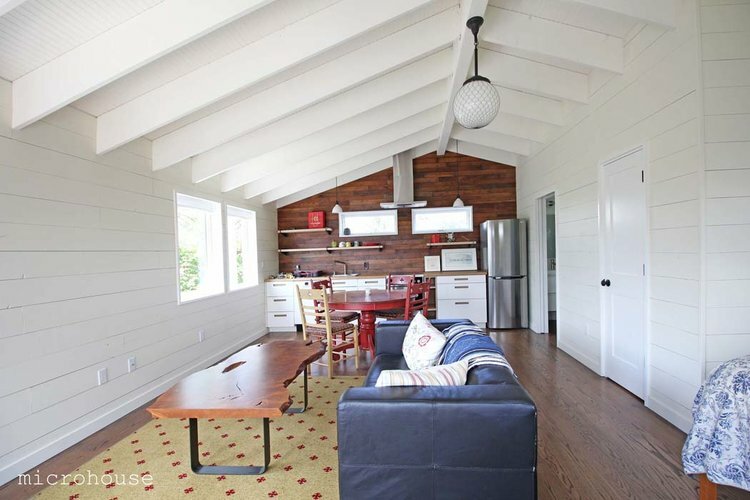 What first got you thinking about building your backyard cottage? Sarah: At first, I wasn't really on board with the backyard cottage. One way Mark convinced me was the fact that we don't have a basement in our house and we have two teenagers. So it would be a place that they could bring their friends and hang out. And our younger son has been doing that. We also have a lot of family and friends visit. It’s a great place to come and stay. I also love travel and meeting people and Mark convinced me that we could rent it out to people, so that was another thing that convinced me. Mark: There are other visions too--having a renter back here, making it a subsidized rent so that we can help with housing affordability in Seattle. That's a good way for us to give back. And from a pure value standpoint, we maximized the value of our property. What was in your backyard before you built the cottage? Mark: There was a simple gable roofed garage built in the 1960’s. We couldn't use the CMU block wall [structurally], but it was an aesthetic that I didn't want to lose because I wanted to grow vines, and that's a really beautiful surface to do that with. So we kept that and just put in new interior walls. Sarah: We also gained height in the basement level, so it’s a nice usable garage now. And Mark had this great idea--that he had to sell me on--that turned out to be a really great feature of the cottage. The wood in the kitchen is the tongue and groove cedar ceiling from the original garage. What were your concerns as you started the project? Sarah: One hesitation for me was normal construction stuff--we were going to lose access to our backyard and garage for a while. Mark: Cost was also a concern. We went into it with an idea of the cost, but set aside some contingency funds. And in general there was just regular nervousness about doing a large-scale project, with some anxieties around permitting. How did you overcome your concerns? Mark: Bruce and Goeff [of Microhouse] helped us. They gave us a lot of confidence. Bruce is good at coaching you through the permitting process. He knows the legislation so well and he knows how the City is going to react to something. From the conceptualization and design through to getting the permits was a really accommodating and pleasant experience. Sarah: Microhouse was always immediate and very attentive. What most surprised you about your backyard cottage—good or bad? Sarah: It’s surprising how much we fit into the small space. It’s functional, usable and aesthetically pleasant. We managed to squeeze all the appliances in. We went back and forth; we weren't sure we wanted a full oven, for example. But I'm so glad now that we have it. We've also got a small dishwasher and fridge. And actually the small dishwasher is really fun because unloading it is no big deal! There’s a washer and dryer. There’s a microwave in the closet, which is also the pantry. Mark: I'm surprised at how much we love the place quite honestly. I'm also surprised at how much the guests like it when they come here. I think they really love staying here because they have their own spot. The bad — we didn't anticipate the neighbor to the north building a new house that would impact our privacy. Some of the neighbors’ windows face right at us. What is your favorite thing about your backyard cottage? Mark: The shell of the place: the vaulted ceiling, the exposed rafters and the wood. The roof peaks have different elevations. It's a curiosity. Some people say, “You know your roof is crooked.” The ridge beam actually travels 12 inches up from one end to the other. It shoots out and becomes a feature on the outside of the house. It’s details like that where we had a lot of fun. And I like that we made it more raw--exposing the rafters and putting on the spruce siding. There's no drywall, which is great. Mark: Yeah, even on a gray day. It's got a lot of windows. The other thing is that it’s simple. It's a box with two rooms, a bathroom and a storage closet. It makes you feel like you're on vacation. Seattle DADU code changes - almost there?